This bamboo armchair, "Margherita", was designed by Franco Albini and manufactured by Vittorio Bonacina in Italy. The armchair remains in a very good vintage condition and comes with its original wool cushion: please see pictures for further details. Color Brown ,Red Width 70 cm Depth 80 cm Height 96 cm Seat Height :39 cm. 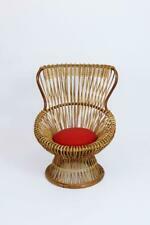 Antique C. 1890 Bamboo Turned Doll's Arm Chair, English..